Eye-shadow primers help shadow last throughout the day without creasing or smudging, but they're not always in the average gal's makeup kit. Fortunately, there are many other tips and tricks to give eye shadow staying power. 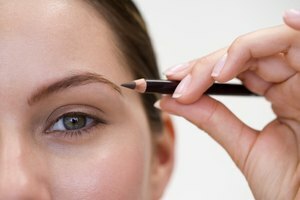 You may have thought concealer was just for under the eyes, but try applying it on the lids to form a base for your eye shadow. Foundation works, too. This trick also brightens up the entire eye area while helping the shadow stick. Next, dust translucent loose powder on your lids to keep them matte, control oil throughout the day and form an ideal base for eye shadow to adhere to. High-quality eye-shadow brushes can be pricey but worth the investment. They allow you to apply the shadow in thin layers, slowly building up to the desired tone. Eye shadow lasts much longer when applied this way instead of with the sponge applicators that often come with the eye-shadow palette. Your fingers might seem like a good blending tool, but you risk adding extra oil and breaking down the pigment of the shadow. Wash eye-shadow brushes often with soapy water and let them dry thoroughly in between uses to prevent the buildup of bacteria.